2017 is tomorrow and as such we say farewell to what was a big year for the Penguins. The monkey was ripped off of their backs as they searched for that all too expected second Stanley Cup. It's safe to say that for every Penguins fan this is near the top, if not the top, of their list of 2016's biggest moments. As such we, the staff at PI, decided to share our biggest individual moments of 2016. The biggest Penguins moment for me is a no-brainer but it goes back to 2009. I remember watching friends on social media attend the Cup Final that year and see the Penguins play for it all against the Red Wings. I had friends at Game 7 who saw the Penguins win it all. I was deeply jealous and never knew if I'd get the chance again. And the Penguins made their miracle run in 2016. Professionally, I'm a freelancer. I work in sports production. I've worked for ESPN, Fox Sports, and even in the ECHL. My schedule is extremely flexible. I watched, and listened, to the Penguins win Game 7 of the Eastern Conference Finals on my iPad as I filmed a college baseball tournament. I also had near a week off after that tournament ended. I received a text not long after from a friend, a long time season ticket holder named Rick. "I'm trying to get rid of tickets to Game 2. Know anyone interested?" In short order, my girlfriend cleared her work schedule and on Monday we drove from Charleston, SC to Pittsburgh. Tuesday we made our way back around downtown with the day stopping as we made our way to the top of Mt. Washington where she said yes. Wednesday we made our way to Game 2, taking the T into town and soaking in the atmosphere of the already growing crowd set to watch on Mario's screen at 3 pm on a hot Wednesday afternoon. The seats were even better as the game wore on. Scoreless through the first, PHIL! Kessel and the HBK line made it 1-0 in the second right in front of us. Unfortunately, in the third with less than five minutes left (mere moments after my fiancée uttered "Only four minutes left!") Justin Braun tied the game up at 1-1, right in front of us. With heart rates racing and stress running throughout the building it happened. Once again, right in front of us. The Penguins had won 2-1 in overtime. At MY Stanley Cup Final game. I'd interned for the Penguins five seasons before. I'd be in CONSOL countless times. I'd never felt the atmosphere as I had that entire day. I'd never felt a scene as I had after the Sheary goal found the back of the net. Having been fortunate enough to attend the NFC Championship Game in Charlotte earlier in the year, the atmosphere there paled in comparison to what I felt that night in Pittsburgh. As we left the arena and chants of "WE WANT THE CUP! WE WANT THE CUP!" echoed through the halls of CONSOL and later outside in the city of Pittsburgh I marveled at my two day, last minute trip. It could not have gone better. I was now engaged and saw my Penguins take a 2-0 lead in the Stanley Cup Final in the Cup game I never knew I'd attend. It was a moment in time I'll never, ever forget and it's easily my top Penguins moment from 2016. 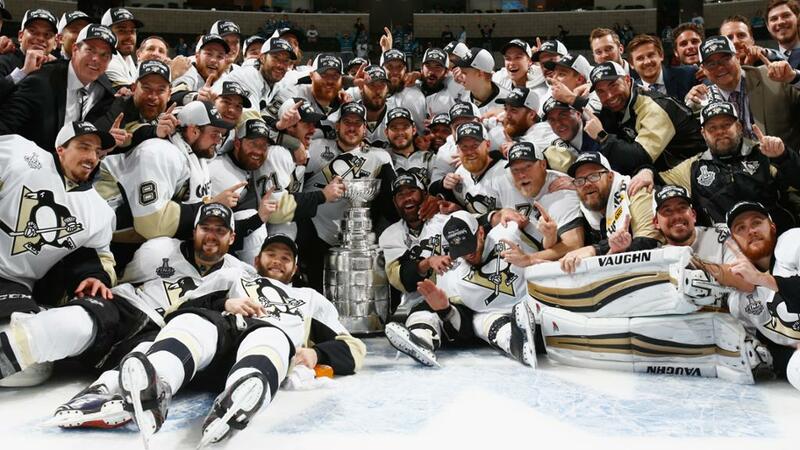 The Penguins winning the Cup in 2016 really made all other moments not shine as bright. I remember telling my son while watching Game 6, "You need to understand how special this is. Some people never get to see their team make it this far for their entire lives." However petty, I think my favorite moment of 2016 was the Lundqvist meltdown game. It was a special time of the season in which the Penguins were on a roll. They bought into Sully's logos and you just knew that this team was for real. On the opposite end, I can't stand how Lundqvist is considered "The King." I know, I know, it's just a nickname but Lundqvist is one of the most overrated players in the NHL. Benefiting from a top media-friendly market, Lundqvist's name somehow always sneaks into the mentions of elite goaltending. For a player who's only won the Vezina once in his 12-year career and NOTHING ELSE doesn't scream elite Hall-of-Fame goalie to me. Anyways, when the Rangers are doing well, you hear about it. Being the same division as the Penguins, you don't want to hear about how good they are. Additionally, they humiliated the Penguins the previous year in the playoffs. This was a team easy to dislike. This all changed in 2016. The Penguins went 3-1 in the regular season matchups with the Rangers, railing them for 12 goals in 4 games. It was one particular game in March where wins are at a premium to fight for the coveted playoff spot. The game was a close one but the Penguins were just settling into their tenacious, speedy style of play. The Rangers were chasing them all over the ice and blocking shot after shot. The frustration boiled over and McDonagh plowed into the diva, Lundqvist. He flips his net and his temper-tantrum saturated every sports feed on the planet that next morning. Yes, it's fun to poke at your rival. This - to me - was a sign of the Penguins getting the final stink of Johnston out of the room. Another Penguins narrative shattered that they couldn't beat the Rangers, or that they couldn't solve the King, or the Ranger's defense was the best in the world. It showed me a team that had all the right tools to win it all and exposing the fraudulent claims that The King was still mighty. What a wild ride it's been! 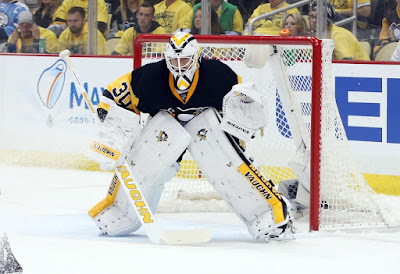 Looking back on the year, my favorite moment might not be a moment per se, but rather that the meteoric rise of Matt Murray carried over from the AHL, through limited NHL starts in the regular season, and firmly took hold in the playoffs. Murray still has only 30 regular season starts to his name, but his numbers so far (0.929 SV%; 2.10 GAA) suggest that this 22-year-old Stanley Cup champion is here to stay, and that his prime years could see more Cup celebrations in Pittsburgh. I had to think long and hard about this. In a year that brought on such a roller coaster of emotions and a plethora of magic moments, narrowing down the field of what my favourites would took some brain poking. After breaking a few pick axes, I have come to the conclusion that there isn't just one, but two, main memories. One is not necessarily a favourite, but will always be burned to memory going forward. We will get the more negative memory out of the way (let's face it, the sad memories are ingrained in our brains just as much as the great ones). Why something negative you might ask? This particular moment was a real time look at change in the making. 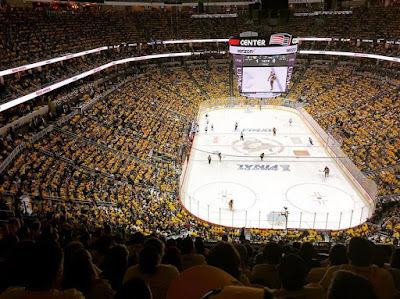 It was a minute period of time that hung in the air like fog, and once it lifted, brought the bright, shining light of a new era in Penguins hockey. The date was December 11, 2015 (it's only three weeks from when 2016 started so it counts). I had received great tickets for my birthday (lower bowl, all right!) and was hoping for a good game. After a drawn out battle with the LA. Kings, the Penguins found themselves in a shoot out to decide the game. Pretty exciting, right? Free hockey. With the shootout tied at one a piece, and having already sent out Sidney Crosby and Evgeni Malkin for attempts (both of which were unsuccessful), former Head Coach Mike Johnston would make a decision that would ultimately bring about the end of his tenure behind the bench. Instead of sending out Phil Kessel, who had the hot stick all night and was itching for more, Johnson sent out the least likely player ever imagined for a shootout. He sent out Nick Bonino, who at that point in the season, was struggling to find his game. Being at that game, it felt like time stopped. The second Bonino's name was announced as the next shooter, there was a half-a-moment of utter silence, followed by an audible and unison, "HUH????!!!! WHAT???!!!" by the 18,000 plus in attendance. The befuddlement was promptly followed by head shaking and the sound of feet heading towards the exits, even before a shot was taken. Fans new what was coming next. Bonino's attempt would fail, and the Kings would go on to seal the win with their next attempt. As I made my way up the stairs to leave, I took a look across the ice at the Penguin's bench. There was Johnston, standing at the opening of the locker room tunnel alone, looking at the score board with the look that had become all too familiar to fans. The look of a coach in over his head. The look of a coach who had run out of ideas not knowing what to do to right the ship. As he turned to head to the locker room, he gave a deep sigh, and headed down the run way to face whatever might be next for him. As I watching him fade from view, I knew I had just witnessed the end. It would be the last time Mike Johnston would ever make that walk inside Consol Energy/ PPG Paints Arena. Ok now onto something more positive and it all revolves around one player. It is safe to say Bryan Rust has become a favorite of mine. Since the day he even came into the organization, I felt there was something more to this kid than meets the eye. It is always the quiet types that surprise you. My suspicions were proven correct as he has developed into a versatile scoring threat on the Penguins roster. He thrives wherever you put him. He scores, he chirps, he plays smart, and is as quick as a hiccup. He is everything a coach could want in a well-rounded player. When it comes to big time moments in big time games, one would think that it's the captain or another high-profile player that takes the reins. Then again, the most memorable occurrences can sometimes come from the least likely of sorts (ex: Max Talbot). The same can be said for Bryan Rust. He etched his name into Penguin's lore forever in what became my favorite moment all season. By now we all know what game I am referring to. Game Seven, Eastern Conference Final, a chance to play for the Stanley Cup on the line. I'm not easily impressed by celebrities or superstar athletes. I have my favorites, but I won't shell out hundreds of dollars to attend their concerts or games. I shirk away from heavily-attended book signings, or any crowded event for that matter. I'd hope that if I were to ever meet a celebrity I'd admire, I'd be really casual about it. No big deal. Unless it's the 2016 Stanley Cup Parade. Then all bets are off. There was something different about this Pens team. We all felt it and we all knew that last season had the makings of a storybook kind of championship. I'd dare anyone to write a better narrative. I knew I had to go to the parade. Even if I couldn't find anyone to go with me. I was willing to brave the crowd of 400,000 for a chance to celebrate with Pittsburgh before I moved to Boston. I drove from Youngstown that morning, and quickly made my way to the parade route. I begged and bargained for a spot on the railing. I quietly stood there for over two hours on a brutally hot June morning, boxing out anyone who tried to take my little space. Once the parade started (late) and the honor guard made it's way down the street, I started screaming my head off like the fangirls I mock. As the players passed it was like a wave of energy moved through crowd. You knew who was coming before you could see them because it was like a giant game of Telephone through the crowd lining Boulevard of the Allies. I screamed right along with everyone and shouted the players' names, desperate for them to look at me. 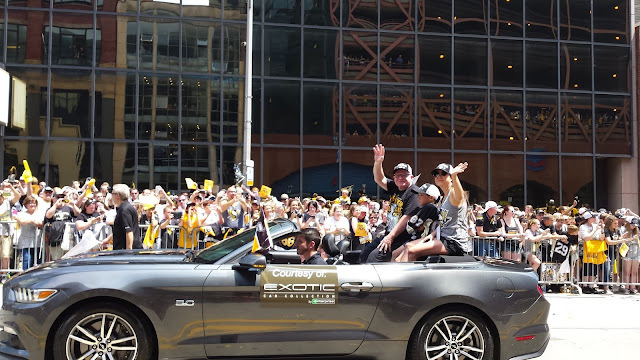 I nearly died when the cars were backed up so far that Mario Lemieux's car was parked in front of me for what felt like ten minutes. I called his name, smiled and waved. And he looked right at me, smiled and waved. MARIO WAVED TO ME. I just stood there awestruck staring at greatness. I slapped hands with Kunitz and Bonino. I nearly started crying when Flower came down the street and the parking garage ahead of me erupted. From where I was standing, he got the loudest cheers of the day. It was easily one of the best days of my life. There's nothing that compares to the feeling of being surrounded by so many people feeling the exact same positive emotions you are. No criticism. No disappointment. Just pure joy and elation. 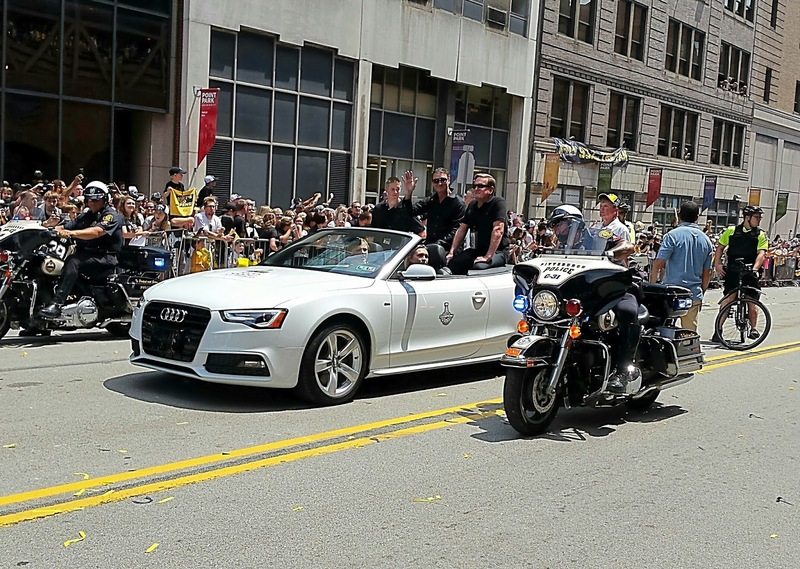 And Pittsburgh really knows how to throw a parade. I went to the Cavs championship parade exactly one week later, and believe me when I say it was very clear that Cleveland had no prior experience with championship parades.